I wouldn't say that this is a recipe at all. 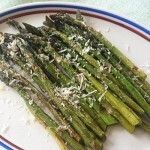 It's so simple but tasty and gives you another idea for asparagus. Line an oven tray large enough to hold all the asparagus in one layer with aluminum foil. This will make clean up easier. Wash, dry and trim off the woody ends of the asparagus. With a brush, brush all the asparagus with the olive oil. 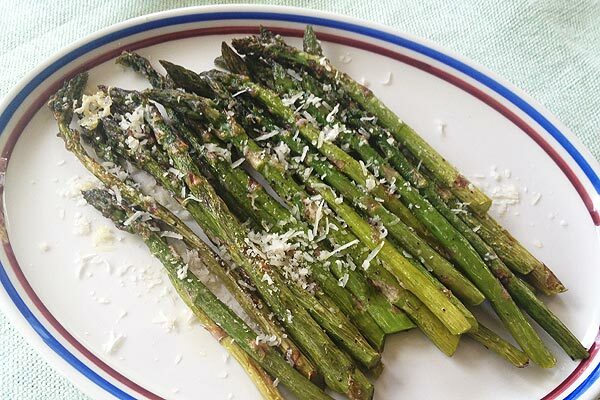 Place the asparagus on the tray, salt and pepper them. Roast in the top third of the oven for 10 to 15 minutes - This depends on how thick the asparagus are. Medium ones should take about 12 minutes. Check as they roast. Remove from the oven and sprinkle over the cheese and return to the oven just long enough to let the cheese melt. Place on a serving plate with a little extra olive oil drizzled over them, sprinkle over the parsley and a few wedges of lemon if you like. This is super easy and quick! I use the parsley because it really helps to brighten up the presentation. You can serve this as an appetizer or a vegetable with the main course. You can also use them cut into smaller pieces for a salad.